View of guardrail at upper level terrace. 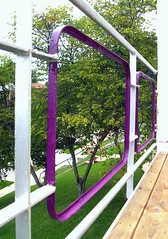 The portion that has been painted purple originally contained panels of wired, frosted glass. The remainder of the steel guardrail structure is coated with the zinc protective paint similar to the original finish of the entire metal structure.